Can urban planning tools help negotiators develop creative solutions to complex disputes? Karen Lee Bar-Sinai, Loeb Fellow at Harvard Graduate School of Design (GSD), recently explored this topic in a talk entitled “The Role of Urban Planners in Negotiations: Case Study of Israeli-Palestinian Negotiations.” The first in a series of seminars co-sponsored by the Middle East Negotiation Initiative at the Program on Negotiation and GSD, Bar-Sinai’s presentation offered some intriguing suggestions for how integrating urban planning into the process of negotiation could be beneficial, and sparked a lively discussion on the limits and potential of this approach. 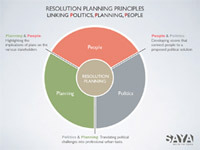 Bar-Sinai suggested that the practice of bringing spatial awareness into conflict resolution, coined “resolution planning,” brings together three spheres: people, politics, and planning. She then explored how resolution planning can enhance negotiations in multiple ways: by bridging the gap between agreements, words, and reality; by creating a spatial toolkit for negotiators and interested parties; by emphasizing flexibility and creative options for “enlarging the pie,” and by connecting the challenge of finding a negotiated settlement to a broad vision of urban planning. In her talk, Bar-Sinai drew lessons from her work at SAYA/Design for Change, an Israel-based company co-founded by Bar-Sinai and Yehuda Greenfield-Gilat that specializes in what can be called “peace architecture” – an architecture and design practice that uses planning, architecture, design, and visual tools to support decision-making, negotiations and peace processes in areas of conflict. After the presentation, James Sebenius, a Harvard Business School professor and faculty-affiliate of PON’s Middle East Negotiation Initiative, moderated a lively question and answer session. Some attendees questioned Bar-Sinai about the limits of utilizing urban planning tools, which deal only with spatial aspects of land, in a conflict where land has symbolic or emotional meaning as well. The creative potential of this approach and the applicability of resolution planning to other conflicts were also discussed. Bar-Sinai’s talk was the first in a series of three seminars examining how urban design thinking and planning can aid the negotiation process in general. The seminar series is being organized by Dr. Shula Gilad, Senior Fellow at PON, and Karen Lee Bar-Sinai. The second session, entitled “The Role of Architecture in Negotiations: Designing a ‘Yes’ in Jerusalem,” will be held at Harvard’s Graduate School of Design on November 20, 2012.